With the holiday season upon us, we recommend you consider purchasing gifts and books online at Amazon.com through the links on our Home Page (left side), on the Books page (click on any Book title) or by clicking here.� Most Amazon.com shoppers have a good shopping experience.� You can buy new or used products from various companies for competitive prices.� There is free shipping for many products, and they have a good return policy.� In addition, purchases made through links on our website help us continue to expand our free website, without costing you anything, and may even save you money through Amazon�s discounts. 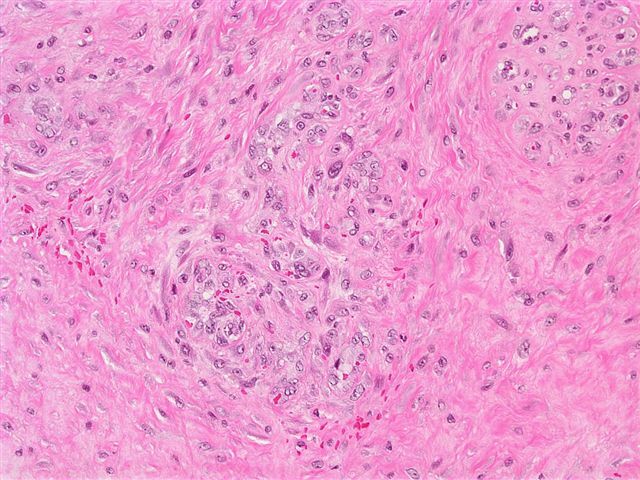 A 55 year old man presented with a left hip mass.� He had been bedridden for some time, but had no history of ulceration or trauma. The prominent cells were immunoreactive for actin, focally positive for desmin, and negative for S100 and cytokeratin. 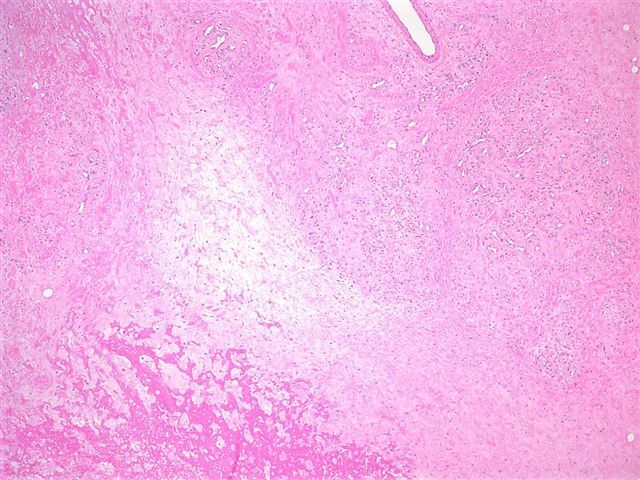 Ischemic fasciitis, first described in 1992 as atypical decubital fibroplasia (Am J Surg Path 1992;16:708), is a sarcoma-like fibroblastic proliferation, usually of soft tissue overlying bony prominences, that occurs primarily in immobilized and elderly patients.� It rarely occurs in young adults (Int J Gynecol Path 2004;23:65, Path Int 1998;48:160).� The most common sites are the shoulder, chest wall and sacrococcygeal region. 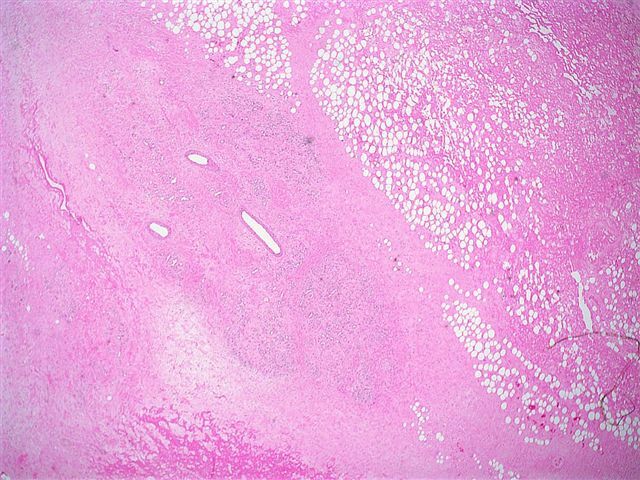 The mass is usually 1 to 8 cm, poorly circumscribed and often myxoid.� It usually involves the deep subcutis, and may extend into adjacent skeletal muscle.� Ulceration is uncommon. 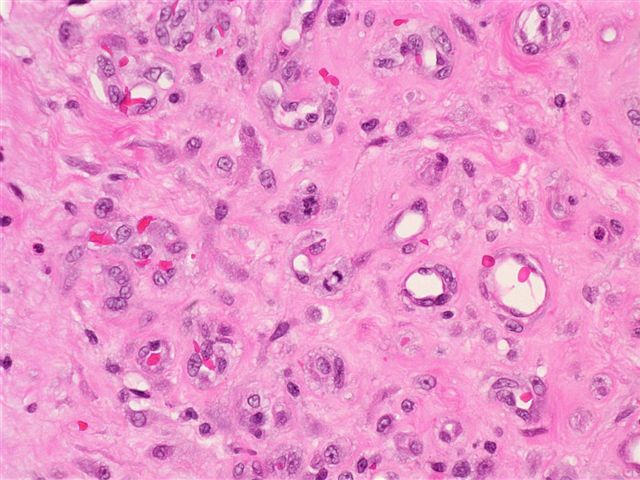 Microscopically, there are zones of fibrinoid necrosis and prominent myxoid areas surrounded by ectatic, thin walled vessels and proliferating fibroblasts.� The endothelial cells may be atypical.� The fibroblasts have degenerative features of abundant, basophilic cytoplasm, enlarged nuclei with smudged chromatin and prominent nucleoli. 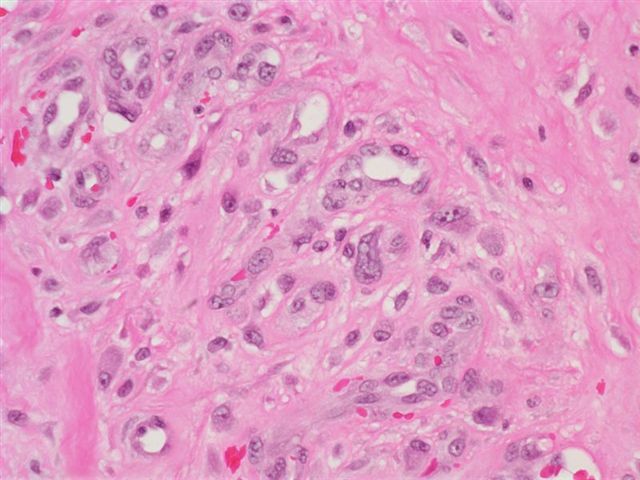 �There may be frequent mitotic activity, but no atypical mitotic figures.� Fibrin thrombi are common within peripheral vessels.� There may be multivacuolated macrophages, but no lipoblasts.� Fine needle aspiration shows spindled and ovoid cells with ample cytoplasm and occasional nuclear atypia (Acta Cytol 1997;41:598). The fibroblasts are immunoreactive for vimentin, actin and CD68, with variable CD34 immunostaining.� They are usually negative for keratin and desmin. Local excision is curative, although recurrences have been described. 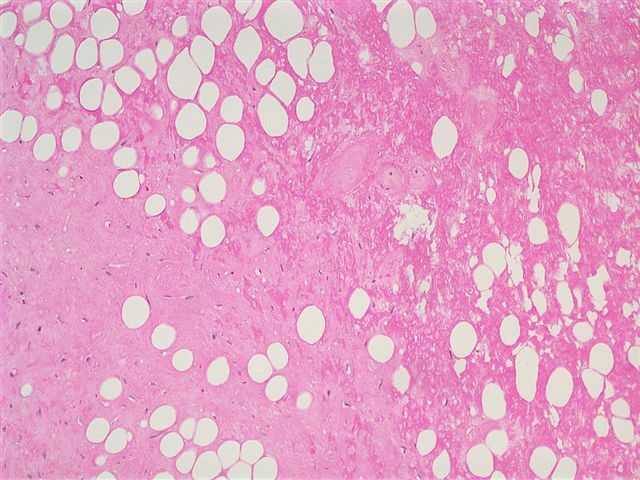 The differential diagnosis includes epithelioid sarcoma, myxoid liposarcoma and myxoid MFH.� Epithelioid sarcoma has central necrosis, but typically occurs in young adults on the distal extremities, and is composed of cells with prominent eosinophilic cytoplasm that are keratin positive.� Myxoid liposarcoma has a prominent plexiform vasculature and lipoblasts.� Myxoid MFH has marked atypia, but no smudgy chromatin or fibrin thrombi.� In addition, it lacks zonation.